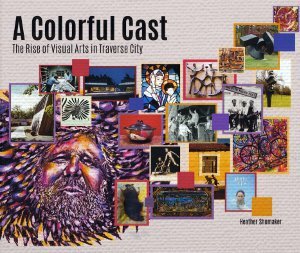 TRAVERSE CITY — Copies of A Colorful Cast, a newly-published retrospective chronicling the rise of visual arts in the Grand Traverse Region and the legacy and rich history of the NMC Art Department, are now available for purchase. Conceived by retired NMC art department chairman Paul Welch, written by local author Heather Shumaker, stewarded by NMC archivist Ann Swaney and designed by NMC Visual Communications students, A Colorful Cast highlights the men and women who created a wave of visual arts in the Grand Traverse Region and celebrates the role that NMC played in building regional interest in visual arts. The galleries, the studios and the festivals that now draw thousands to our region all were influenced by the vibrant learning environment of Northwestern Michigan College and the artists who have gathered and learned here. Copies of A Colorful Cast are $29.95 and are available at the NMC Bookstore, Dennos Museum Store, at Horizon Books in downtown Traverse City and through the NMC Foundation by calling (231) 995-1021 or purchasing online here. Proceeds from the sale of A Colorful Cast will go to support visual arts scholarships at Northwestern Michigan College.